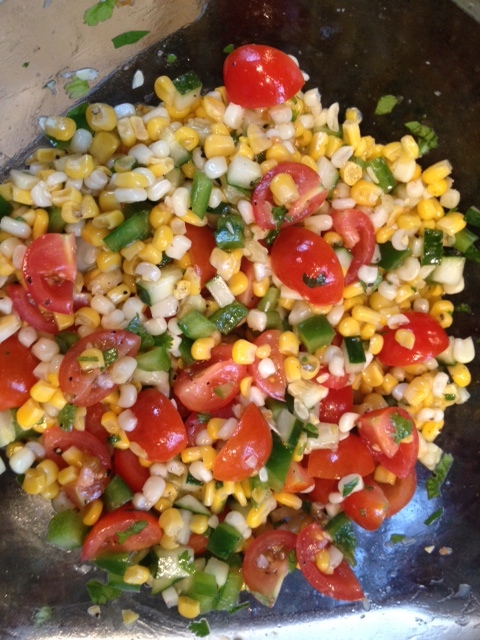 Corn Salad | Om nom nom! A colorful and fun side salad, this is one I’ve served mostly with Latin or Mexican themed meals. It has a lot of flavor and dresses up chicken and pork especially well, I have found. This would be a good one at a picnic or BBQ. If you can do fresh corn with this, great – about 3 -4 ears. If not, a bag of thawed out frozen corn would be fine too. Combine all ingredients in a large bowl and toss. Cover and chill at least 2-3 hours, but a whole day would be best. Serve cold.